The wife and I have been ultra busy with projects around the house. Earlier last week we put up a gazebo on the back patio. Also, we planned on cleaning out and organizing the garage on Saturday, but totally got to it on Friday afternoon while our little man slept inside. After a trip to Brookfield Zoo on Saturday, we had time to relax on Sunday. Originally, we were going to take a walk, but the landfill in Hillside was stinking up the area, so we decided to take Cam into the city for a Sunday drive on Lake Shore. It was beautiful, and while he fussed in and out of sleep, we still had time to enjoy the views and the old memories that returned when we turned towards Logan Square. 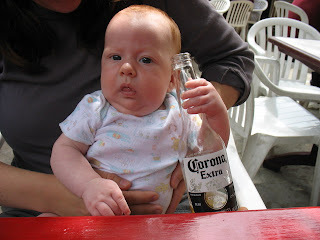 We hooked up with Jenn and Keith and took him to El Cid II on Milwaukee and Diversey for Coronas, limes, and burritos. It's funny to remember that the last time we were there, Scott and Libbi were telling us that they were pregnant, and here we were, roughly one year later, posing our baby with beer bottles in front of him. I love this picture, btw. He just woke up from a nap and was ready for some lunch of his own. Also, he peed on me while we were there. I can't believe how totally okay I am with that.